Evander is a two column blogger template with sidebar to its left and post section to right.The theme is designed by web2feel and converted by me to blogger.The design is minima style.Top menu page links are ready for you.Seo for title has been done and it supports all blog features and is compatible with all browsers.It has search bar also ready at top of header.Best part about the template design is the use of proffessional color blue which is the favourite of all bloggers.Custom font has also been used for headers and blogger read more feature also working. 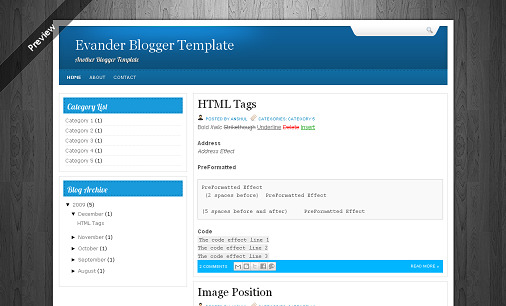 Other blogger templates you may like are Nona and Gamezone. I like some of these other templates because it allows you to be a little different. Before these new templates were created all the blogger sites were the same white and orange templates.